Noch im November wird Eisbärin Patches vom Erie Zoo in den North Carolina Zoo umziehen. Vermutlich wird sie ihren 26. Geburtstag am 29. November schon in Asheboro feiern. Still in November the female polar bear of the Erie Zoo will move to the North Carolina Zoo. She will presumably celebrate her 26th birthday on November 29 in Asheboro. Geboren wurde Patches 1987 im Henry Doorly Zoo in Omaha. Dort lebte sie bis zum Dezember 2007 zusammen mit ihrer Wurfschwester Fanny, die man dort Bam Bam nennt und die immer noch in Omaha lebt. Dann brachte man Patches in den Erie Zoo. Dort plant man nun größere Umbaumaßnahmen. Die Eisbärenanlage des Zoos ist veraltet und soll etwas Neuem Platz machen. Deshalb muss Patches umziehen. Patches was born in the Henry Doorly Zoo in Omaha in 1987. There she lived together with her twin sister Fanny, who was called Bam Bam in Omaha, until December 2007. Then she was brought to Erie Zoo. But now the Erie Zoo is about to embark on its own major construction project and needed to move Patches to a new home. 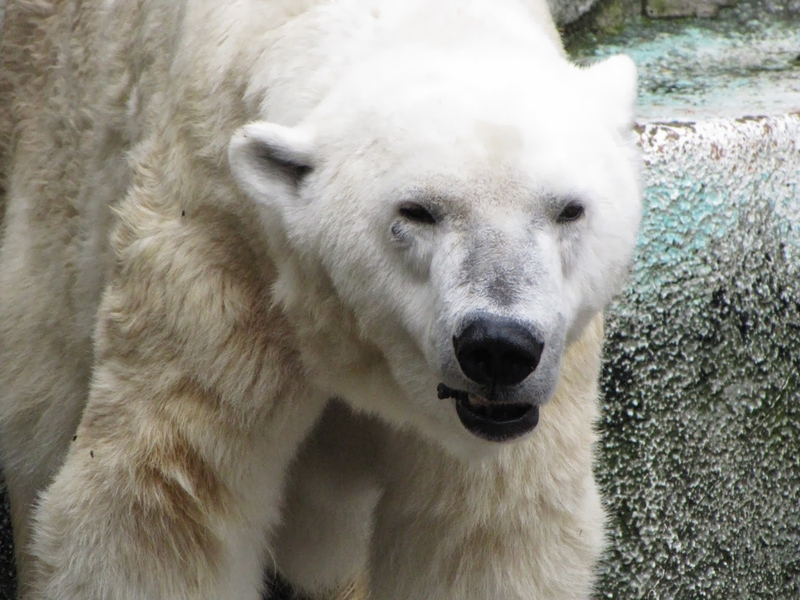 The polar bear enclosure is outdated and has to make way for something new. Der North Carolina Zoo hat in diesem Jahr den ersten Teil seiner neuen Eisbärenanlage fertiggestellt und will im Herbst 2014 die gesamte Anlage eröffnen. Vor wenigen Wochen war der Eisbär des Zoo, Aquila, der gerade erst nach Asheboro zurückgekehrt war, unerwartet gestorben. Nun freut man sich, dass in die „Rocky Coast“ bald wieder eine neue Eisbärin einziehen wird. The North Carolina Zoo has just opened a first part of its new polar bear enclosure. The entire new habitat, which contains a breeding den, is scheduled to be complete in fall 2014. Only a few weeks ago the N. C. Zoos’s polar bear Aquila unexspectedly died. He had just returned home to Asheboro. Now they are looking forward to welcome a new polar bear in their „Rocky Coast“. 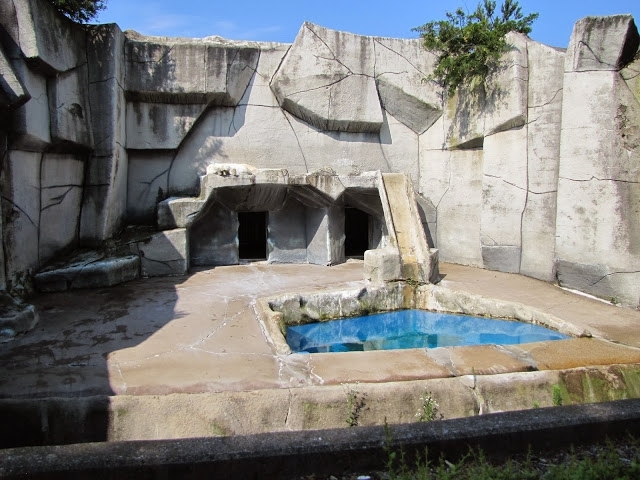 Die Eisbärenanlage des Erie Zoos – the polar bear exhibit of the Erie Zoo, von Molly Merrow. Mehr Bilder von Patches im Erie Zoo findet man in Molly Merrows Blog – more photos from Patches in the Erie Zoo you find in Molly Merrow’s Blog. I am so happy for Patches. I loved visiting her while she lived in Erie because she is such a darling, always looked and me, and has so many cute facial expressions, but I was sad to see how old her exhibit was. People would go by and talk about how sad the bear looked, but no one seemed to know it was a girl, or that her name was Patches. I know the people in North Carolina will love her, and she will love being there. She really does like people, and she will have many fans and friends in her new home. Everyone in Asheboro will know the name of Patches!